Urgent! Looking For Drop Off Locations For Earth Quake Relief! QuakeHelp.net is desperately looking for regional sporting goods stores that will act as a drop off location for people donating sleeping bags and tents for the earthquake relief effort. They are looking for regional stores so that they can get this up and running yesterday rather than going through some large headquarters for permission. You can login as QuakeHelp.net with the same password (QuakeHelp.net). Once on the map there is a link to login in the bottom right corner. Once you are logged in you can add a location by clicking "Add Markers" in the bottom left corner. Please help and spread the word so that we can get this working as quickly as possible. There's no reason you should have to do this. So for my part I made it so that you can paste the multiline address directly into the "Add By Address" box in CommunityWalk. This should make it a little easier to add locations by address. Thanks Hanford for the idea. I've received a number of enhancement requests from people, but probably the most frequent and vocal request was for a way to speed up the process of adding and editing information on a map with a large number of locations. Well I have finally been able to get something in place to alleviate this pain. When you are editing your map you can now put the application in to Quick Edit Mode. You'll see a link for this just below the CommunityWalk header down in the Message Center (the area that glows yellow when a new message comes in). To put the application in Quick Edit Mode click "Switch" where it says "Full Refresh Mode". In Quick Edit Mode the application will not refresh all the locations and tabs whenever a change is made to a location. This means that the tabs and the locations will get out of sync, so you'll need to click "Refresh" to sync everything up. This will speed things up considerably when you are making changes to a map, especially on maps that contain a large number of locations. About a month back I did an interview with CNet for a series they are doing around user generated content. Well they just released the article and it looks good. This part of the series details the mapping revolution that is taking place on the web right now. I just finished putting the final touches on the new "window" function. The purpose of this function is to provide some more flexibility over what you can display in the context of the map. Specifically it was meant to allow people to display panoramic photos in a map, like the ones Dr Andrew Hudson-Smith has taken of London. In fact, Dr. Hudson-Smith visited San Francisco a couple of weeks ago and I had the pleasure of driving him around to take a few panoramics of San Francisco. We were only able to take four pictures, and he has only had time to convert two of them into the quicktime format, but I am just too eager to show off this new functionality, so I went ahead and made a map of the two pictures. I'll be adding in others as he finishes them. The panoramics are not hosted on CommunityWalk. I don't yet offer a solution for that. Instead the window function allows you to display anything you want on the map using an IFrame. This allows you to display any other website in the context of the map. I decided to do it this way so that you would have the maximum flexibility over what content you displayed and so that you can provide more explanation about these links to your viewers. This explanation may be something like "Requires Quicktime" or "May take a moment to display", etc. You can choose to display the IFrame with or without scroll bars and with or without a larger view. You can also designate a maximum size for the larger view. You can find more extensive instructions for this functionality in the forum. There may very well be some bugs with this and I'd love to hear any feedback people have. So please leave comments or drop me an email to report bugs or let me know what you think! CommunityWalk has been down for over an hour now. I've been talking with my hosting provider and he assures me that it will be back up within a half an hour and that he will be putting CommunityWalk onto a new server to prevent these problems in the future. If this happens again though I will be switching hosting providers. I am absolutely committed to making CommunityWalk a stable service that people can trust and I will put as much money and resources towards that goal as necessary. 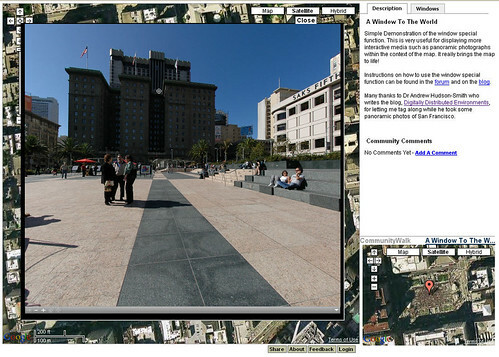 I just finished upgrading the geocoding capabilities of CommunityWalk. Now the U.S. addresses are more extensive and accurate and there is Canadian data as well. Also the geocoding service, provided by Yahoo, offers far more information levels of granularity than the previous service provided by Geocoder.us. This means that I should be able to develop functionality that will let you zoom to a city or zipcode to make the process of adding markers by click more efficient. I'm not sure exactly when I will be able to put such functionality in place, but it shouldn't be too far out. So after about 2 days of hitting my head against the wall trying to figure out why CommunityWalk was crashing Safari I finally discovered the problem. Of course this led to 2 days of hitting my head against the wall trying to figure out how to fix the problem. Well I think I've finally done it. The result of my efforts can be seen on CommunityWalk right now. Safari, as far as I can tell, no longer crashes, but there are still other bugs (sometimes the photos display wierdly - if you see this try to click on the photo again - and much of the editing functionality is broken). With this major bug out of the way, though, I am much closer to making CommunityWalk completely Safari compatible. I will hopefully be able to bring it 100% of the way this weekend or early next week (fingers crossed). In any case, please let me know if you see any bugs. This change was a fairly major restructuring, so I am worried that I might have introduced some other bugs, but hopefully not. So today's been a bit hectic. There was a period of about an hour or so where CommunityWalk was down. I finally got through to my hosting provider and they got it back up and running. I am going to work very hard to make sure outages do not happen. It is a very high priority. In other news I am very close to fixing the bug that causes Safari to crash, I just need to test it a bit and make sure I didn't break anything else. It looks good though. The fix doesn't address all of the Safari issues, but it does stop it from crashing. I'll be looking to fix the other issues asap. Also Yahoo just released a way to geocode Canadian addresses (and probably US addresses more accurately than I am able to currently do on CommunityWalk), so I'll be working hard to utilize this free service to make the Add Marker by Address functionality more powerful. More to come on all of this soon!